On January 18th, in a small town outside of Chongqing in western China, Alan Ryan tapped out to a rear naked choke from Jumabieke Tuerxun. It was a typical fight for both men. Bieke, as he is known to most people, is the top-ranked MMA bantamweight in China. 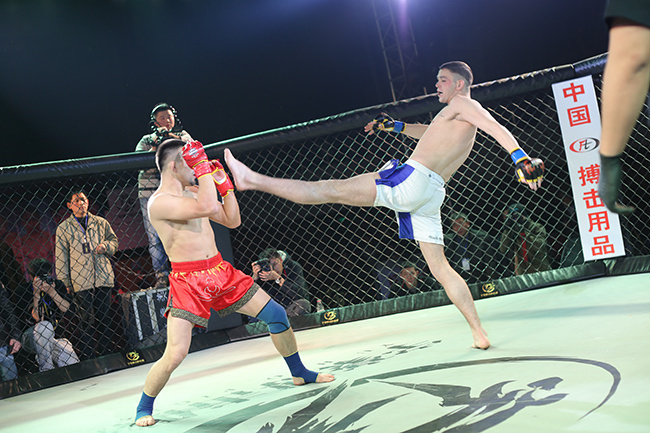 Alan, a Muay Thai and K-1 fighter, is a 25-year-old Scotsman bouncing around China fighting a slew of more-experienced, better-trained fighters for a little less than $500 a pop. After the fight they went their separate ways. Bieke officially signed with the UFC and headed to Thailand to train for his upcoming fight on the Ultimate Fighter: China finale card in Macao. Alan dragged himself out of bed at 4:30am the next day and took a series of planes, trains, and buses to Weifeng, way up north, to get TKOd in the first round ... by a more-experienced, better-trained fighter. Alan fights three to five times a month, and he routinely loses close decisions and often loses fights he’s clearly winning. One guy he TKO’d in the third round was given a minute to rest and then won the fight by decision. The proverbial China vs. the World martial arts show has long been considered a farce to prop up Chinese nationalist sentiments and stave off stereotypes that Asians are “physically weaker” than westerners. In the past there were kung fu vs. Thai boxing matches in which everyone was Chinese and all the “Thais” took dives, and various other demonstrations of Chinese martial superiority taking place in two-bit shows all over the country. But with the rise of professional MMA promotions like RUFF, OneFC in Singapore, and now the UFC out of Macao, those farces are becoming more difficult to pull off. Karl got choked out in the first round. Turns out Karl, who also goes by the name Wesson Consil, trains at the same gym Alan Ryan trains at, the Fighters Unite gym in Shanghai, run by Silas Maynard. Silas opened his gym in 2009 and now has 300 active members, between 14 and 20 of whome are professional fighters. Chinese promotions regularly ask Silas for good-looking foreign fighters with no skills to pit against their top guys. Although he says he turns those fights down, Alan’s recent tapout tells a different story. When I asked him about it, Silas told me that he thought Alan had a legitimate chance. “Alan is a very dangerous fighter,” Silas wrote in an email. “If he could have kept it standing into the second or third round it is possible he could have won that fight. Bieke on paper was more experienced, but having seen Alan train and see his ability to get out of bad situations and get back to his feet, much like he did against Bieke’s armbar [early in the first round], we thought it was a winnable fight. Bieke’s coach and teammate, Vaughn Anderson, agrees with some of that. After Alan delivered a few headkicks early in the fight, Vaughn started screaming for Bieke to take it to the ground and finish it. Later that night, Alan, Vaughn, and a Ukrainian grappler named Artem who also fought (and lost) his first MMA fight, went to the only bar in town and drank fake whiskey. Alan and Artem told two stories. The first was about how they are getting pimped out by their gyms for pennies, and the second was about how much they love to fight and how they’ll fight anyone, anywhere. It sounded familiar to Vaughn. Vaughn’s first professional fight took place on some mats thrown down in front of a department store in Taiwan. Over the next few years he choked out sumo wrestlers, fought dudes who showed up to fight with painted faces, and watched a fighter dressed in a full-body ninja suit puke his guts out after a show. Vaughn finally got his break when the now-defunct Art of War promotion came to Taiwan looking for fighters. He knows all about trying make a living as a foreign fighter in China. Alan said he sometimes wishes he could be back in Glasgow training with his hometown gym, the Dinky Ninjas. But going back home would mean taking a full-time job to finance his training, while in China it's all fighting all the time. "I know I am getting shafted, but that is just the way it has to be right now,” Alan said. “I'm just going for it. I am looking for new management though, so stick that in your article for me."